Leading Manufacturer of surge protection for oil & gas pipelines and cathodic protection surge arrester from New Delhi. HGS100 Ex - Separating high power gas discharge tube HGS100 Ex for use in explosion hazards areas. It is intended for equipotential bonding of the installation parts of buildings or technological entities which are not interconnected operationaly. In case of p.d. (potential difference) origin between those parts, the high power gas discharge tube ignites and interconnects both parts for a transient time (typical value of internal resistance at startup of HGS100 Ex is 0,001÷ 0,002Ω). 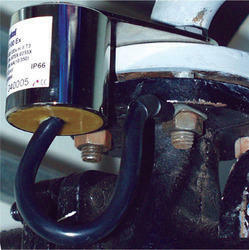 Recommended installation is inside of the buildings, outdoors, in the damp rooms as well as in the subterraneous areas. The natural gas pipeline infrastructure, including transmission lines, distribution lines, processing plants, compressions stations, gate stations, and underground storage facilities, is susceptible to Iightning strikes. This infrastructure encompasses approximately 310,000 miles of natural gas transmission pipeline, 1.9 million miles of natural gas distribution pipelines approximately 3,000 compression stations, and the associated electronic supervisory control and data acquisition (SCADA) systems used to control the infrastructure. This vast size provides a high probability that there will be Iightening strikes on or near the natural gas infrastructure on a reccurring basis. In addition to the substantial size of the present world pipeline infrastructure, it is estimated that the combined global growth of the pipeline infrastructure under construction or in the planning cycle for 2012 will be 118,000 miles. The two major areas of growth are the Asia Pacific Region, (34,295 miles) and the North America Region (31, 951 miles). The entire piping system must be treated not only against lightning strikes, but also equipped with isolating gas discharge tube for equipotential bonding (HGS100 Ex) at all technological facilities of the system. Buried pipelines for oil, gas and other inflammable materials are normally provided withcathodic. This, in turn, requires the use of insulating flanges at terminal points on the pipeline system, such as at tank farms, governor stations, etc. In order to limit the extent of the appliedcathodic protection and prevent the loss of protective current to other buried metallic structures. In these locations, in the event of a lightning strike on to any above ground pipe work or connected structure, or an electrical fault causing a voltage surge on the pipe, a flashover across the insulating components to the flange could occur. 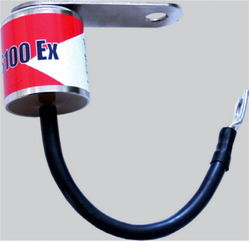 HGS100 Ex is an explosion-proof gas discharge tube Spark gap with flexible connecting cable (varies to meet application requirements) for equipotential bonding acc to IEC 61024-1 and also for the use in IT installations acc to IEC 60364-5-54. It complies with EN 50014 and EN 50028 standards. It is recommended for insulated flanges and insulated screw joints bridging incathodic protected parts of industrial technology. In case of potential difference origin between two sides of insulation flanges, the high Spark gap ignites and interconnects both parts for a transient time (typical value of internal resistance at startup of HGS100 Ex is 0.001… 0.002). HGS100 Ex is certified for EEx m II T3 (FTZU 04 ATEX 0255X) and is suitable to be used in hazardous areas. The reasons motivating the choice of the interconnection of metallic masses are important. They should be well known in order to consider acceptable solutions that may reconcile the incompatibilities between these standards and the cathodic protection. On should well distinguish the risks of lightning and other potential surges that may lead to damage to electrical equipment, the electrical hazards for personnel as well as the means to ensure their protection. For the risks of lightning, theoretically, on could not implement a grounding circuit. It is useless with respect to the issue equipotentiality as mentioned above. Moreover, the grounding resistances, measured at low frequency (50 Hz) are totally different from the value of their impedance which is to be considered at very high frequency (lightning). In fact, the grounding systems are of no use for the evacuation of the lightning currents, they only act as a protection of personnel against the hazards related to the potentials at industrial frequencies. Because of this fact they have been made mandatory by the legislation in force. For the protection of persons the important criterion consists of avoiding a potential difference, which is deemed hazardous, between two regions of the human body. In case of a potential test post, for instance, a grounding system should be installed at the location where the individual is supposed to touch a point at which the potential is different from the one where his feet are in contact with the ground. A person is always supposed to be exposed to a potential difference if he touches two parts that are electrically isolated one from each other (for instance two metallic structures separated by an insulating joint). It is this reason that justifies the interconnection of the metallic structures. By interconnection of metallic masses one should understand the interconnection of the structures (including rebar of concrete and the grounding systems of buildings), the grounding of the premises (safety of personnel) and the lightning protections. The essential objective is to ensure a preferential path of return, of the lowest resistance, for the currents to the ground. Moreover the potential gradient created at the ground surface by the flow of the current is diminished with regard to what it would be on individual groundings (safety of personnel).